Dr. Stanley Milgram was not a one-hit wonder in the field of social psychology, but his career arguably peaked in 1961. Yes, he continue to produce original and even groundbreaking research throughout his professional life, but he would always work under the shadow of the Yale experiments that bear his name. Miligram’s life and work are dramatized in an aptly psychologically expressive fashion in Michael Almereyda’s Experimenter (trailer here), which opens this Friday in New York. You have heard of Milgram’s work whether you know it or not, but in the early 1960s, plenty of unsuspecting subjects volunteered for his study on obedience and authority. Each participant agreed to serve as the “Teacher,” whose role is to administer electric shocks of increasing and potentially lethal power to the “Learner” for every wrong answer. Despite the pre-recorded screams of pain, they continued to mete out the punishment, because a man in a lab coat told them to. The high percentage of subjects administering he maximum voltage startle even Miligram himself. For years, the implications of the test and the underlying deception are hotly debated. They make Milgram’s name and establish him as an expert, but he regularly finds himself re-debating his techniques and assumptions. Of course, his critics did their best to ignore the elephant in the room, which Almereyda boldly represents with a real elephant trailing Milgram down hallways. He was after all, the American-born son of Eastern European Jews, who was understandably fascinated by the Eichmann trial roughly coinciding with his [in]famous experiments. 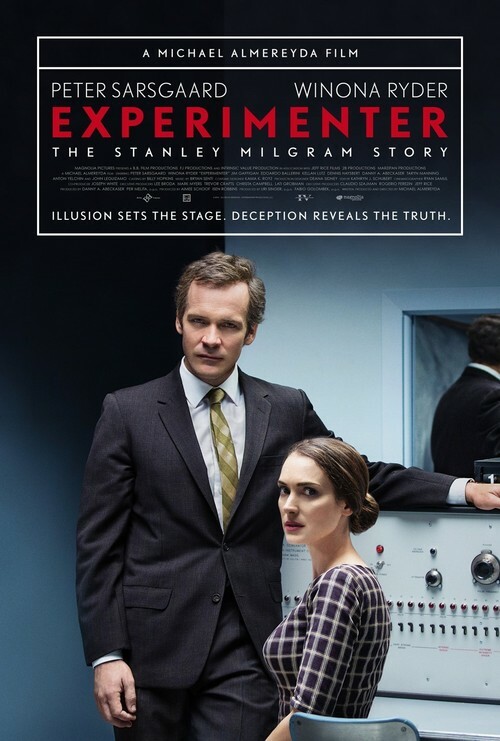 Experimenter is a relentlessly stylized film that deliberately eschews any pretense of verisimilitude. Yet, it almost has to reject the trappings of conventional drama too accommodate Almereyda’s comprehensive survey of Milgram’s work and the criticisms he faced. He is a decidedly cold fish, but his constant fourth wall breaking commentary is fascinating stuff. Ranging freely between arrogance and defensiveness, Peter Sarsgaard gives one of the strangest, but still unconventionally effective performances you will see this year. Frankly, it takes a while for viewers to banish their reservations and buy into Almereyda’s rear-screen projections and self-consciously artificial backdrops. However, the artistry of Ryan Samul’s cinematography and the wonderfully exaggerated but not quite over period look crafted by production designer Deana Sidney and art director Andy Eklund is immediately impressive. It is also hard to beat the surreal eccentricity of Milgram meeting William Shatner and Ossie Davis (played with fitting attitude by Kellan Lutz and Dennis Haysbert) on the set of a TV movie based on his experiments. It is rather encouraging to see a film as ambitiously cerebral as Experimenter let loose in theaters. Yet, it comes at an opportune time, when fewer people seem to have the skills to rigorously question and dissect what the media tells them. Intellectually challenging and visually playful, Experimenter is a film that engages on multiple levels. Recommended unruly freethinkers, it opens this Friday (10/16) in New York at the Landmark Sunshine.